Here it is just a few days before Halloween, and I get a call to rescue a black cat named Boo Boo. How appropriate. 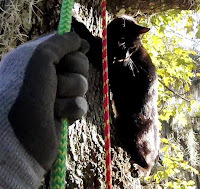 Boo Boo is an eight-year old boy who had been stuck in a tree for three nights before I could get to him. He is fortunate to live with a very small, rural, close-knit community of people who care very much for him. They all worked together to find a way to get him down themselves, but were unsuccessful. That is when Kerri found me by doing a web search, and I agreed to go out there first thing in the morning. 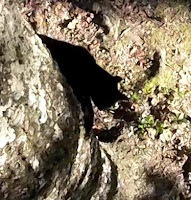 When I arrived at the site, I easily found Boo Boo crying less than 15 feet high in the tree. I met Kerri there and she introduced me to Linda, the one who feeds Boo Boo. They told me that Boo Boo is not normally friendly with strangers, but he certainly was crying in the tree as if he would be happy to see anybody who would help him. He clearly wanted down, and he wanted down now. I was hopeful that he would be cooperative. I set up my rope and he watched with interest but not alarm. He remained on his branch the whole time, and this was a good sign. As I climbed up toward him, he made motions to come down as if he couldn't wait for me to get there and wanted to meet me halfway. Again, another positive sign. Or was it? 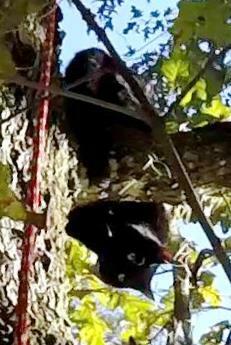 As I climbed closer to him, he came downward off his branch and clung tightly to the trunk of the tree in a head-up position. He froze there as I came level with him. Now I was not so sure if he was trying to meet me halfway or trying to get away from me. Whatever it was, it now became clear to him that he might be able to make his way down on his own terms. So he began to work his way down, mostly in a sideways position, and was soon just a few feet from the ground. At that point he jumped to the ground and sauntered off. 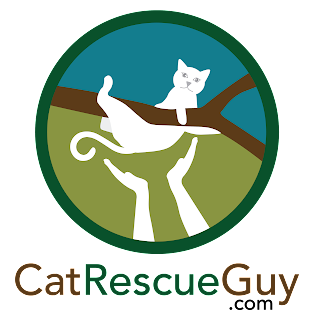 That was not the way I had envisioned this rescue would unfold, but it worked out well just the same. Kerri and Linda were very relieved to see him down at last, as it had been very stressful for them to see him stuck for so long. I gave them a can of food to give him, and Linda and Boo Boo walked off to her home for a much-needed feeding. Boo Boo looked fine, and I know that Linda will take good care of him now.